On my way back to the house from this morning’s walk I passed through the new section of our orchard. 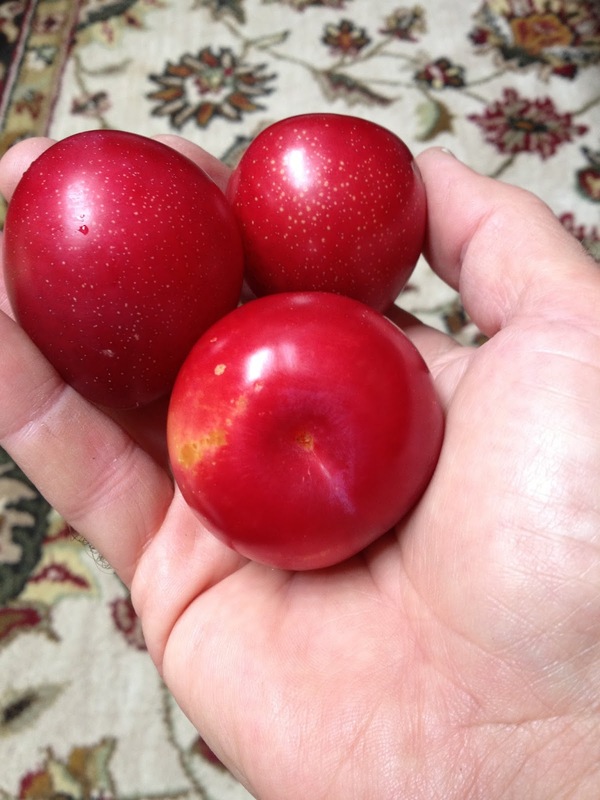 There it was in front of me…on the most slender and scrawniest of the new trees…an incredible crop of plums. At the thickest part of its trunk this young tree is less than 1” diameter, and yet this stalk was laden with beautiful ruby-red plums the size of goose eggs. I picked three and brought them up to the house. Their flesh was juicy and sweet and as I ate the sticky syrup ran down my arm. All told there were close to a twenty ripe plums produced by this scrawny and unimpressive tree. The irony is that surrounding this tree are several dozen others, all of which have no fruit at all. The other trees are far more impressive; they are taller, they have longer branches, and they have more verdant foliage. They look the part, but there is no fruit to be seen. Without knowing the fruit-worthiness of the smaller tree I would never have thought it would be the hands-down winner in plum production this season. I would have selected one of the other far more impressive trees and eventually come up empty-handed. Today, as I’ve been thinking about this single tree I think there is a parable to be learned…appearance has little or no bearing upon fruitfulness. What often impresses us as life, health, and vitality really has no connection to true fruitfulness. And, oftentimes, God uses the weak and unimpressive to manifest much fruitfulness. These are those of whom the world is not worthy (Hebrews 11:38). Consider the incredible life of Irena Sendler. By every measure she was unimpressive. Her life was largely lived in obscurity and a fawning media would never recognize her. She would never win a Nobel Prize, as she was far too unimpressive and ordinary. She was a commonplace sort of tree bearing fruit without accolades, pomp, and circumstance. She had no agent or promotional handlers. She would never do a stint on American Idol. She did her most impressive work in secret and did it for those wouldn’t dare utter her name. For Irena appearance was antithetical to fruitfulness. The enemies of true fruitfulness in Jesus’ day were those who could put on a good show. They were religious spinmeisters and by every appearance they had it all together. They impressed by both outward show and word. They wore the right clothes and talked a good game. Jesus, in brutal honesty, called them what they were…decorated tombs. They were adorned to make an impact while keeping their true identity hidden. They had impressive language and religious jargon down pat; all the while inside they were full of dryness and death. For them the only thing lacking was the one thing that really mattered…true fruitfulness sourced from a right relationship with God. Here’s the bottom line…God is unimpressed with showboaters in His name. Any tree can look like a fruitful tree (at least until harvest comes!). How we look and what we say mustn’t belie true fruitfulness. 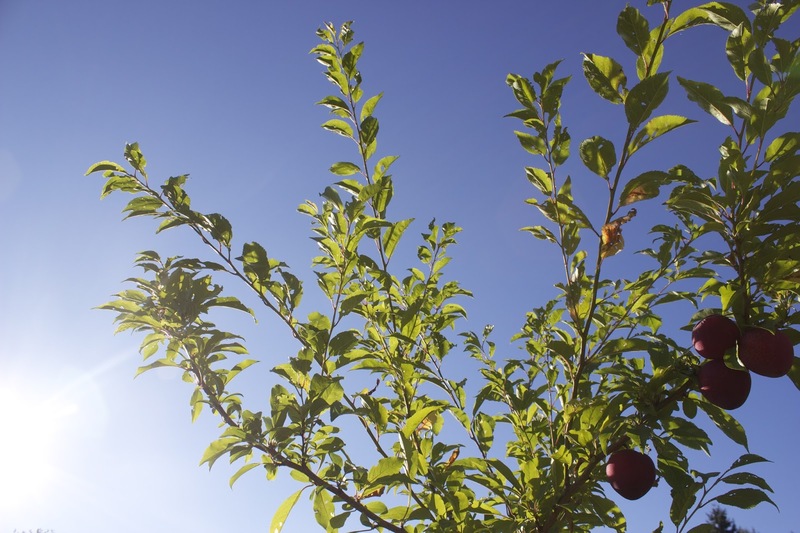 To turn Jesus’ phrase…a tree is known by its fruit and not by its hardy trunk and lush foliage. In the religious circles I run in the temptation to hypocrisy is exceedingly strong and especially seductive. I know, because I’ve fallen for its supra-gravitational pull. All I have to do is look the part and speak the language and I can fit in with the best of them. It is much easier to wear the accoutrements and speak the jargon than to bear God-exalting fruit in unimpressive weakness and obscurity. I’d rather live my life as emboldened front-page headlines than as a little-known footnote, soon forgotten. I may be able to nuance theological minutiae, but the real question is whether I lay down my life to serve and love others. I may dress in my Sunday best, but at the end of the day what do my kids say about what I’m really like? No one cuts through the appearance of religion better than my own wife, kids, and those who are closest to me. The lesson of a stark and solitary plum tree in an orchard full of pretenders is this…in the unfolding of God’s unexcelled plan of salvation He will be glorified by the least impressive tree that bears much fruit. In other words, in God’s grand drama of redemption it’s for this purpose that He has created us...we have been created, not to impress with verdant foliage, but have been created to have lives laden with God-exalting fruit.